The 2017 college lacrosse season has been unforgettable so far, and we've seen 3d Lacrosse alumni in both the men's and women's game continuing to lead the way for their teams and make their mark. In the third edition of our 3d Alumni in the College Ranks feature, we find more players who are representing the 3d Methodology well as they make important contributions for their respective teams across the country. 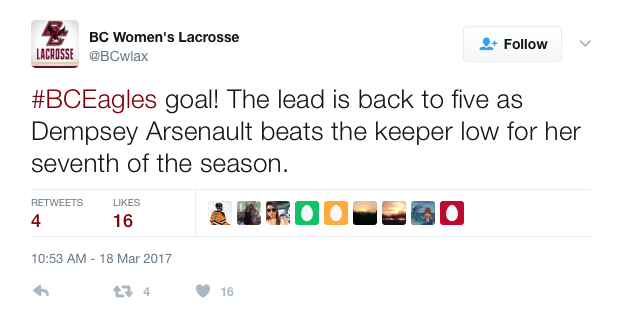 Follow us throughout the year as we root for the young men and women making us proud out on college lacrosse fields this season. Austin helped his team to two wins since we last checked in. In the Falcons 13-8 win over Detroit Mercy he scored two goals and added one assist. That increased his season total to three goals and for assists. Sean has continued to be a staple on his team’s defense. He scored his first goal of the season and added two groundballs in a 14-6 win over Mercer. He’s increased his groundball total to 10 and his caused turnovers are now at five for his season totals. Paxton has been strong in his past two starts leading the Falcons to two wins over both Detroit Mercy and Mercer. He made seven and two saves respectively in those games. He’s improved his goals against average to 7.97, and is saving 45.1 percent of the shots he's facing. Larken added to his season goal total with a single tally in a 13-8 win over Harvard. He also scooped up another groundball and added two caused turnovers in the win over the Crimson. The senior is second on his team in groundballs with 23 and is second on the team with seven caused turnovers. Jake scored a goal in the Bears win over Harvard and has now scored in back-to-back games. He had a season high two groundballs in that victory as well. He has now got three goals and three groundballs for the season. Jeff was named the Ivy League rookie of the week for his performance in the Big Red’s overtime loss to Virginia. He scored five times and added six assists which were both season highs for him in the 19-18 loss. 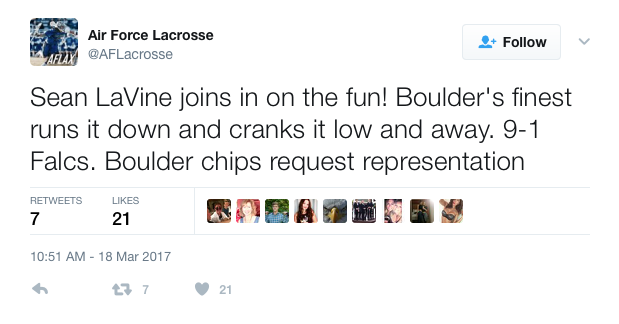 He then added two goals and three assists in Cornell’s 17-8 loss to Yale. The freshman is leading his team in goals and assists with ten and nine respectively. Colton added to his goal total with a single tally in the Pioneers loss to Ohio State and also added an assist. He currently has four goals and two assists this season. Dylan has started each game for the 5-2 Pioneers. His defense has helped his team to allow just 8.57 goals per game. Matt has been contributing to the Blue Devils over their 5-game win streak. He contributed an assist in his team’s 12-7 win over Georgetown. He now has one goal and two assists on the season. Mitch has added two goals over Duke’s last three games. 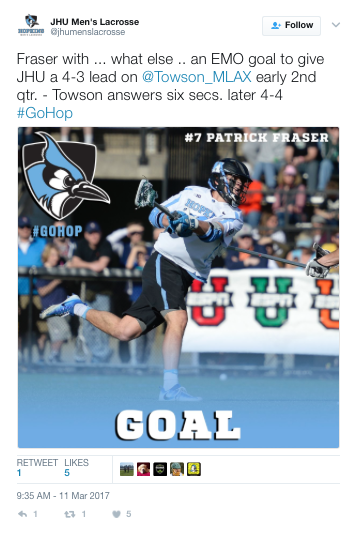 He scored in the 15-7 win over Loyola and also added a goal in the 12-7 win over Georgetown. His six goals puts him towards the top of the scoring for the Blue Devils. 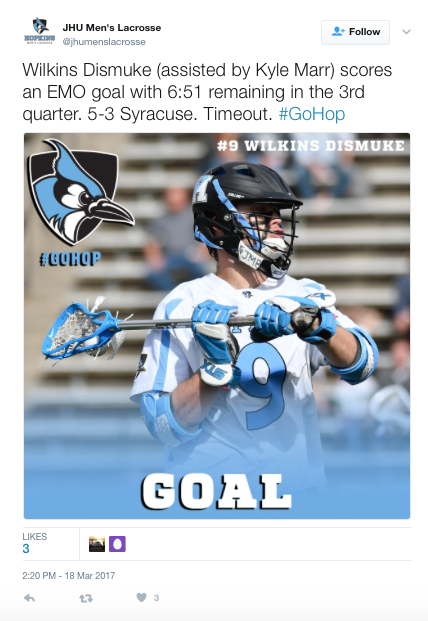 Wilkins has started all seven games for Hopkins leading the Blue Jays in goals with 12. 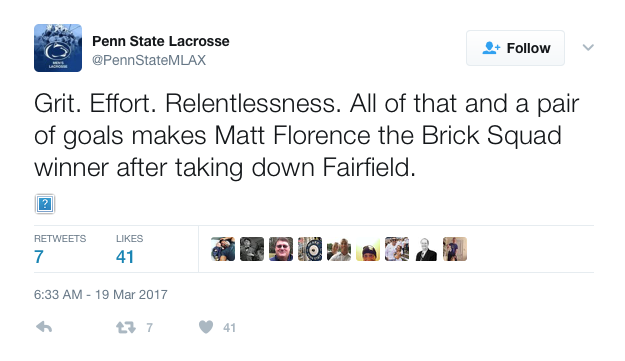 He scored two goals in a 10-9ot loss to Syracuse. 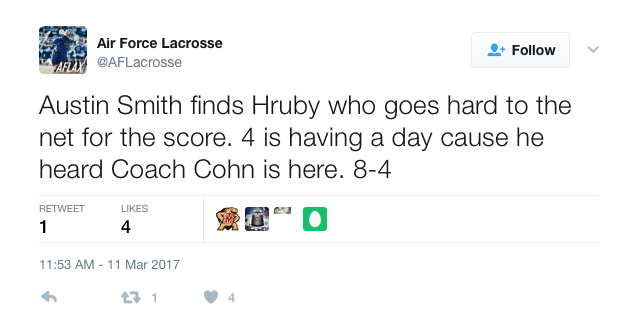 He added an assist in a 13-8 loss to Towson also. Pat has added a goal and an assist for the Blue Jays in the last two games. He scored a goal in the game against Towson and the assist which was his first of the season came in the game against Syracuse. He currently has six goals and one assist to this point in the season. Ryder scored two goals and dished out four assists in an 11-10 loss to Denver. In an 11-10 overtime win over Virginia he scored one goal which was the overtime winner for the Irish and had three assists. He currently has 12 goals and 12 assists and is leading his team in assists and points. He also has 7 groundballs on the season. 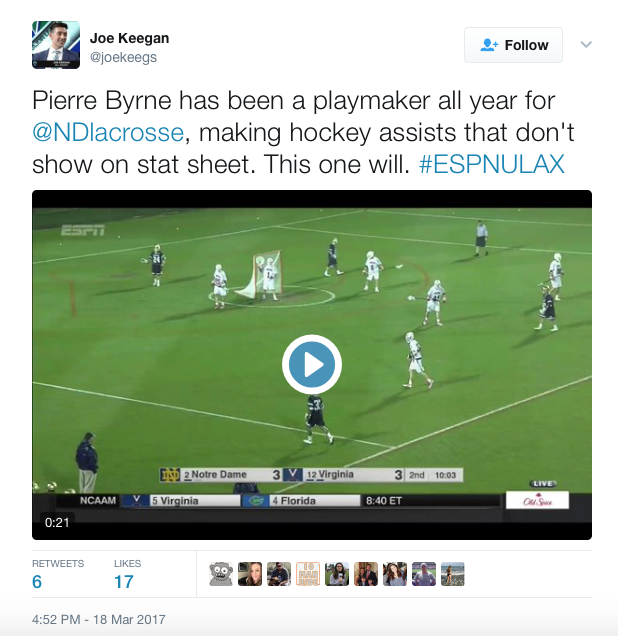 Pierre scored a goal and assisted a goal in the Irish’s overtime win over Virginia. He’s started each game for his team this season and has three goals and three assists to this point. Matt has helped his team out to an 8-0 start. He scored three goals in the Nittany Lions 15-12 win over Harvard. He added two more goals in a 9-8 win over Fairfield. He now has increased his season total to eight goals and three assists. Tanner has continued to be a pivotal piece of the Cavalier defense. 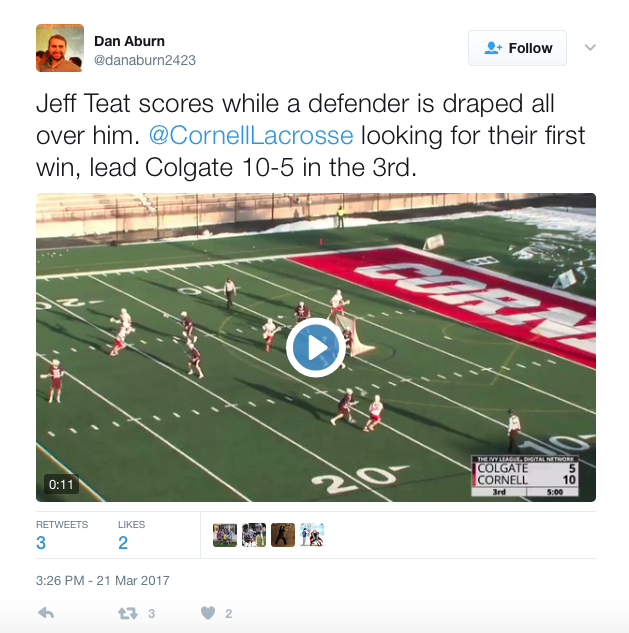 He added two groundballs and added one caused turnover in a 19-18ot win over Cornell. 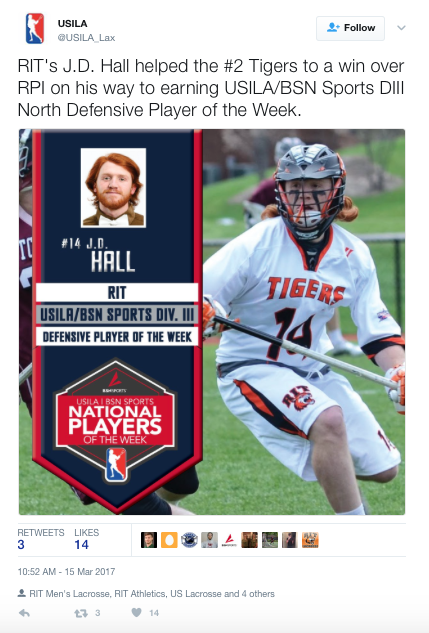 He scooped four groundballs and caused a turnover in his team’s 11-10 loss to Notre Dame. He has 27 groundballs and 11 caused turnovers for the season which are both near team highs. Joe has been starting on attack for the Cavaliers. He scored an unassisted goal in his team’s 19-18 overtime win over Cornell. He has nine goals and four assists so far this season. Dempsey added a goal and two assists over her last two games. The games were a 14-5 decision over Monmouth and a 14-11 win over Louisville. She has 18 groundballs through 10 games which is good enough for the second highest total for the Eagles. Taylor has been scoring goals in bunches for the Aggies. In her last three games, she has scored 14 goals and added five assists for 19 points. She scored a game high six goals in her team’s 14-13 loss to Quinnipiac. She has a team high 28 goals and 11 assists through nine games. Asa has continued to be the starter in goal for the Orange. She had a season high 16 saves in a 17-16 win over Harvard to help her team break a two-game losing streak. She is averaging 10.92 goals against average and has been saving the ball at .456%. Cody has started each game for the Purple & White helping them to a 3-2 start. He had a season high 15 saves in a 17-16 loss to RIT. The following day he had 10 saves to help his team to a 10-8 win over Lynchburg at the Mustang Classic. He is allowing 12.47 goals per game and saving the ball at .475%. Sam has helped the Bobcats to a 5-0 start. His work at the faceoff-x has been a big factor in his team’s success. He went 28 for 43 at the x in a 23-17 win over Amherst and 13 for 19 in a 14-7 win over Trinity. He’s winning at .633% on the season. Jimmy scored three goals and dished out three assists for a game high six points in the Polar Bears 17-7 win over Hamilton. He’s currently second on his team in both assists and points with four and seven respectively. PJ has added six goals and three assists in the Camels last three games. With his three goals and one assist in his team’s 12-6 win over Roger Williams he was the top goal scorer and point scorer in the game. He has also added 14 groundballs for his team. JD has been off to a great start for the Tigers earning the Liberty League’s defensive performer of the week for his play in a 14-9 win over RPI. He had a goal, two groundballs and caused 3 turnovers in the win. He added two assists and four groundballs in a 17-16 win over Amherst at the Mustang Classic. The senior has five goals and three assists through six games. He is also leading the team in caused turnovers with 13. Taylor has scored multiple goals in each of the Cardinals games this season. 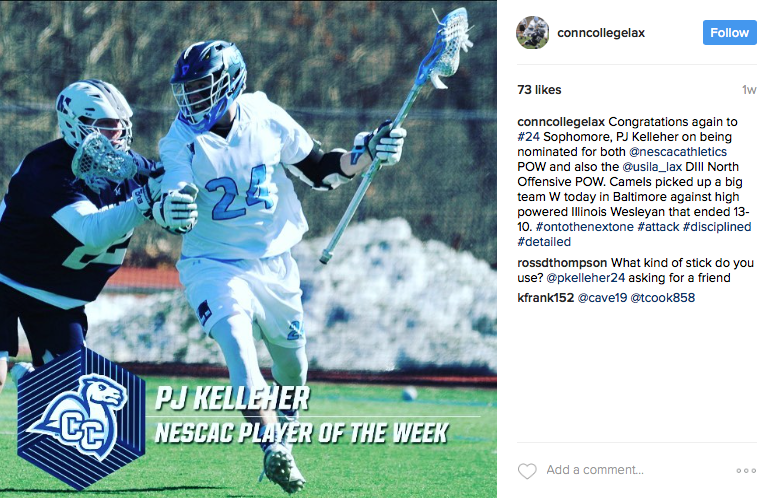 He had a season high of four in his team’s 17-15 win over conference rival Middlebury. He’s scoring on 57.7 percent of his shots and is second on his team with 15 goals.